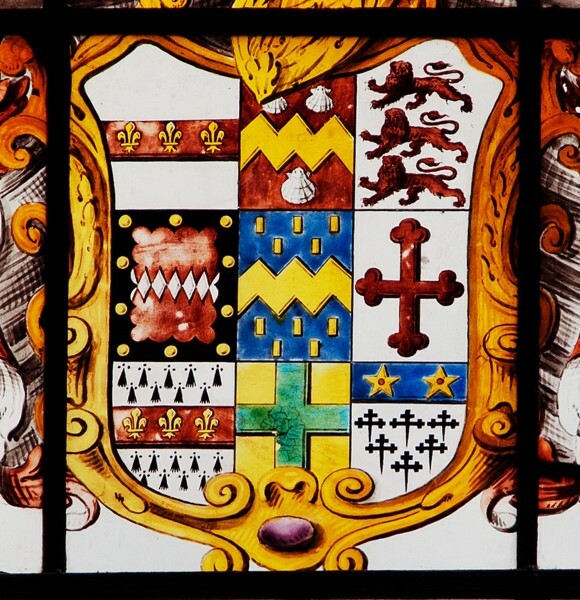 A news item in Vidimus 80 (May 2014) offered persuasive evidence that an armorial panel recently rediscovered at Belsay Castle (Northumberland) was a previously unknown work by Henry Gyles (1645–1709). A remarkably similar window at Flintham (Nottinghamshire) can now also be attributed to the same famous York-based glass-painter. The Flintham panel was discovered some years ago boxed up in an attic at Flintham Hall (a Grade I country house rebuilt in 1798 on the site of an earlier property) and installed in the chancel of the nearby church of St Augustine [Fig. 1]. 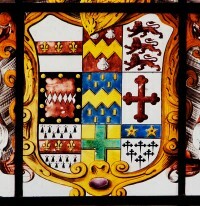 It shows the arms of an important local family, the Disneys, in a setting almost identical to that of the Belsay window. 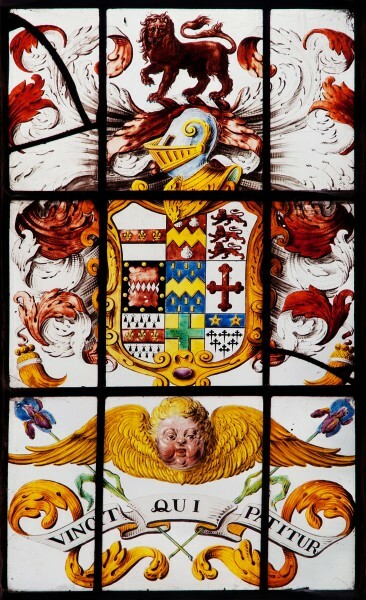 Although neither window is signed, each displays the same chubby winged cherub’s head that appears on earlier works signed by Gyles, notably a royal arms of 1681 at Adel (Leeds), and a sumptuous armorial window of 1676 for Sir John Frescheville at Staveley (Derbyshire). In fact, apart from the colour scheme and heraldic details the only obvious difference – so far unexplained – is in the choice of flowers flanking the motto [Figs 2 and 3]. When dismantled, the Belsay window was found to incorporate lead cames bearing the imprint *EDMOND*GILES*OF*YORKE*1665*, showing that they had been drawn from the mill that Gyles had inherited from his glazier father. The arms displayed are Middleton with the Lambert arms ‘in pretence’ (that is, placed in the centre of the shield, signifying a marriage to an heiress and the claim, or ‘pretence’, to future ownership of her family arms). In this case the panel was clearly made to mark the mark the marriage of Sir John Middleton, bart., to Frances Lambert, daughter and heiress of John Lambert of Calton (himself son of John Lambert, the Civil War general). The bride’s father belonged to a group of virtuosi (artists and enthusiasts for the arts) who used to meet at Henry Gyles’s house in Micklegate in York, so providing a further link between glass-painter and client. The marriage took place at Kirby Malham on 15 June 1699. It seems reasonable to suppose that a similar occasion gave rise to the Flintham window, and it turns out that John Disney was married on 20 May 1698 to Mary, daughter of the then owner of Flintham Hall, William Woolhouse, MD. Unlike Frances, Mary was not an heiress at the time (she only became one in 1725 on the death of her brother), so her arms could not be shown in the same way. 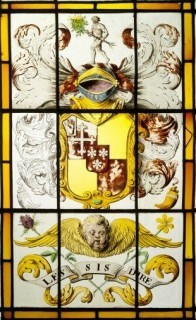 The present panel in fact shows only the arms inherited by the Disney family, up to and including John’s father, Daniel Disney. The ninth ‘quarter’ (bottom right as you look at it) bears the Clinton arms of Daniel’s late wife Catherine, daughter and coheir of Henry Fynes-Clinton of Kirkstead (Lincolnshire) [Fig. 4]. 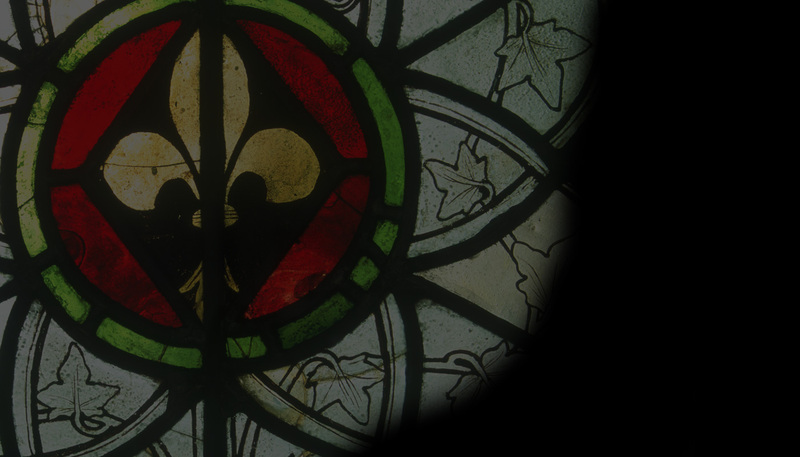 Despite the coincidence of dates, the surviving glass thus makes no reference to John’s marriage to Mary Woolhouse. 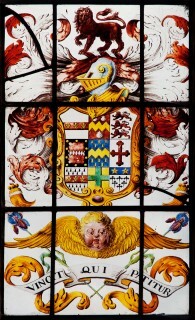 If this was indeed the occasion for it, the likelihood is that there was also at least one matching window, since lost, either honouring Mary’s father by showing his inherited arms, or a marital panel showing the Disney and Woolhouse arms side by side (‘Disney impaling Woolhouse’, the normal style for an alliance between armigerous families where the bride is not an heiress). Fig. 4. Arms of Disney (originally d’Issigny and variants), quartering Dive, Disney (of Lincoln), Nevill (of Nottinghamshire? ), d’Eyncourt, Crosholme, Harbin, Hussey and Clinton. © Gordon Plumb. Although the panel could have been brought to Flintham Hall from somewhere else at a later date, the fact that it was found there strongly suggests that John and Mary Disney made the Hall their marital home, at least for a time. A keen local historian might be able to confirm this. Dr Woolhouse himself had acquired the Hall through his marriage to Mary Hacker, heiress of the family who had lived there since 1628. 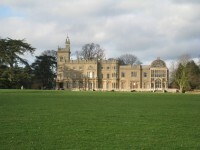 In due course, the Hall certainly passed into Disney ownership, where it remained until 1789, when Lewis Disney sold it to Colonel Thomas Thoroton, adopted his wife’s surname of Fytch, and moved to a house she owned in Essex. The Hall was subsequently almost completely rebuilt, and the Disney arms panel packed off upstairs. I am grateful to Gordon Plumb for his photographs, and to Dr Andrew Gray and Vic Taylor for their advice on the heraldry; the latter’s Heraldry Gazette article on one of its puzzles can be read here. J. T. Brighton’s Henry Gyles: Virtuoso & Glasspainter of York 1645-1709 (York Historian, 1984) is still the standard work on this important glass-painter. A short biography of Gyles is available here.